A great Boston day trip and shopping destination, Faneuil Hill Marketplace offers superb shopping at some familiar designer stores, quality arts and crafts, as well as great restaurants and sidewalk cafés. 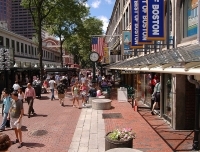 Four places in one, Faneuil Hall Marketplace encompasses Faneuil Hall, Quincy Market, North Market and South Market. Set around a cobblestone promenade, the market is a haven for the performing arts with jugglers, mimes, musicians, and magicians entertaining passers-by. Centrally located and operating for more than 250 years, the Faneuil Hill Marketplace is the hub of Boston city life. Drawing large crowds excited by the electric energy, visitors can shop, stroll, eat, and wander. Opening times: Monday to Thursday 10am - 7pm; Friday and Saturday 10am - 9pm; Sunday 12pm - 6pm.